The Two-Minute Mom – Even the busiest mommy has two minutes for herself! Colleen? Where have you been? Hi All – Yes, I’m still alive but I’ve been very busy adjusting to my new full-time job at Loyola University Chicago as their Director of Executive Eduction. I am thrilled for this new chapter in my career path and was recently featured in an Executive Education Roundtable for Crain’s Chicago. For more information on what I do for my day job, please check it out: http://www.chicagobusiness.com/section/custom-content-roundtable-executive-education. More stories, photos and blog posts to come including a great resource for a potty training bootcamp! Op-Ed: Oh legitimate news stories – where are you? Lately I’ve been hearing the under-the-breath grumblings from Americans who are curious to know where they can read legitimate news stories. Oh what, your Facebook news feed isn’t cutting it anymore? Seriously, according to my students this quarter social media is where they get most of their daily news. Apparently it’s true for most Americans. During the 2016 presidential election many voters chose their candidate based on what they read on Facebook. In a September 2016 article from The Washington Post, How Facebook could swing the election – and who will benefit “Facebook can influence millions of votes by the literal press of a button,” said Michael Brand, a professor of data science at Monash University in Australia. What is really interesting to me about this topic now in 2017 is that if everyone actually cared about the news they were reading 6-12 months ago, we wouldn’t be having this uneasy feeling to start fact checking everything we read now, including from our most reliable news sources. I know I don’t like walking around not knowing what just happened in Washington D.C. to the country I love and not knowing what’s the next big news story just around the corner. In an effort to educate myself and our household, my husband and I agreed we needed to invest in more trustworthy news sources to help educate ourselves with factual news. We agreed that The Washington Post and The New York Times seem to have the most credible stories with multiple sources being cited in their stories on a regular basis. I did some research and found that I was able to get a FREE subscription to The Washington Post and a discount subscription to The New York Times because I am an educator. I applaud these news sources for allowing educators and others to obtain their news with such access. I feel our current President has put us on a news roller coaster since his inauguration, which is extremely exhausting to follow at times. While I may not agree with the policies the President has put into place, I feel it is my duty as a tax paying, voting American citizen to educate myself on what is happening to MY country. I vowed a long time ago to take social responsibility online and to not share any news stories on social media that are nonfactual and not vetted by a credible news source. I would like to challenge all social media moguls (i.e. Mark Zuckerberg) to make it part of your user online rights and responsibilities to have all your users check off on a “online social responsibility policy”. There are policies in place that you cannot use online images without the permission of the creator of the image, (and yes thank you to everyone who keeps cutting and pasting the same “rumor” FB policy from 2009), I believe that everyone who wants to help make a more educated and informed society to take the same online social responsibility pledge with me. I ask everyone to have more accountability online when posting new stories and to not repost anything from a non-credible source. But realistically money drives our world. What amount of advertising dollars would Facebook and other social media sites loose if their fake news sources couldn’t post on their website anymore? What would society be if online trolls who like to stir the pot with fearful posts about what is not actually happening in our country or worldwide do with all their free time? Wasn’t the internet created for us to share more information at our fingertips and to keep people in touch, but has since torn friendships and families apart? Take responsibility for your posts, delete them if you think they are untrue, follow up with educated responses when you find someone who is not like-minded as you, and learn to listen more than you speak (or post). 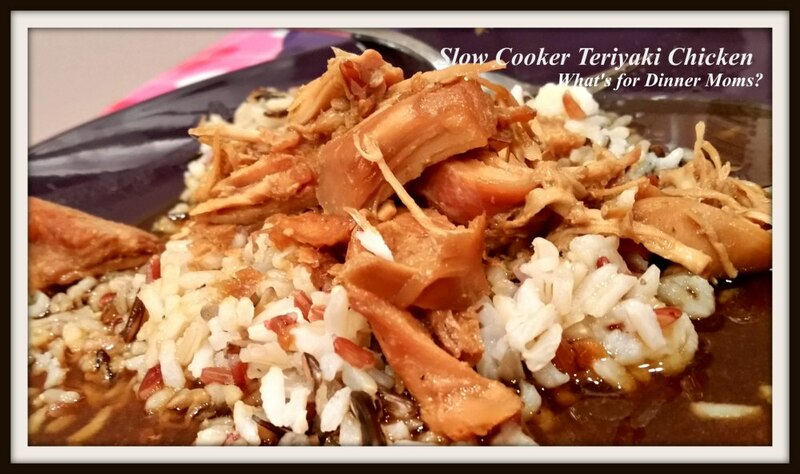 Excellent crock-pot dish for busy days! We added 2 orange bell peppers, fresh pineapple chunks and onions for extra nutrition. I am usually pretty meh about slow cooker chicken breasts. The problem is most days I over cook them because something comes up and I leave them in the slow cooker an hour or three too long. They are a bit dry and chewy. But, chicken breasts were on sale and I had them thawed so I decided on Teriyaki chicken. I did my research this time before making this dish. On low chunked chicken breasts should cook in about 6 hours. I couldn’t leave it in the slow cooker all day so it took a bit of planning on my part. I knew I wanted to have dinner about 7 pm so I needed to have it in the slow cooker about 1 pm. Yes, we eat late because all the classes and practices after school. Is Maternity Leave Really Over Already? How does 40 weeks waiting for a baby to arrive take an eternity but 12 weeks (sleep-deprived) while caring for a newborn go by so quickly? Ah, America! While I appreciate the 12 weeks that I am “allowed” to take off work from my employer to care for my newborn child, who just started sleeping through the night at 10 weeks, the thought of going back to the daily grind of work is met with mixed emotions. For us, a lot has happened between Halloween – MLK day. Here are some highlights: My parents sold our childhood home, moved to a new 55+ condo community and both retired! Our second son was born and baptized and has brought great joy to everyone in our family. We also bought a new car, well actually a new minivan which I am thrilled about! My husband and I both celebrated our birthdays and we had tons of Christmas / winter holiday fun. I actually thought this was just something people said when they had a fussy baby. BOY WAS I WRONG! About 3 weeks after our son’s birth he was crying all the time and nothing would console him. I tried everything to calm him down. While working on my “I don’t want to compare my two boys” language in my head I really couldn’t have had two more opposite newborns, despite the fact that they look identical. Jimmy on the left and Marty on the right – both at 12 hours old. After two weeks of trying to change formulas and adjusting my techniques on how to comfort our son, I finally went in to see the doctor. My exact words to the doctor were, “I don’t want to be one of those parents who says my child won’t stop crying…but my child won’t stop crying”. He informed me that he’s probably a little colicky, potentially having a bout of acid reflux and gave us a few tricks to try, but ultimately he said that “this too shall pass.” Those words were like throwing gasoline on the fire to sleep deprived parents. Looking back, I’m so glad we went to the doctor. Lesson learned: having some piece of mind when parenting is key, even if you don’t have all the answers. It gave my husband and I some piece of mind to know that yes, you have a screaming baby, but you are doing everything you can – and that’s the best you can do. And yes, the doctor was correct – about two weeks after our visit our son turned a corner, the screaming stopped and he has been a very good baby since. Sometimes you’re in survival mode, and that’s okay. I know there were days when my parenting dos and don’ts were totally mixed up. If our toddler wanted to play games for a while on his tablet so I could sit down and have lunch – sure! Actually questioning when was the last time I had a shower or “did I really just have my 5th cup of coffee today?” – common place when you’re in survival mode! Yes, I realize that you need to take care of yourself in order to be a good parent for your child, but sometimes just getting to nap time with the kids or reaching the end of the day without a blowout diaper was the greatest accomplishment. Lesson learned: everything in moderation is key to keeping balance in our household. A little time on the tablet when requested was just enough to keep a little toddler happy (and Mommy could enjoy her one a day cup of coffee in peace). There were a few days when I would tell my husband I just needed to get out of the house for a bit. As this maternity leave was in the winter months, cabin fever was raging in our home for everyone. Taking time to leave the house to shop at Target alone or to get a mani/pedi were far and few between but extremely appreciated when I did them. I felt like ME again. I am used to leaving the house at 7am for work and not arriving home until close to 5pm. Those hours on my commute to and from work and my lunch break were always ME hours. Having that little ME time when I was able to was and is still clearly something I need to keep my sanity. Date nights were few and far between but we were able to sneak away from the boys to see Rogue One and have dinner at Lawry’s The Prime Rib, Chicago. Lesson learned: Needing to take time away from being parents while still taking care of yourself and your spouse will refresh everything. A strong circle of other parents is key. When I was pregnant with my first child and I was trying to put together my baby shower registry, I had posted on Facebook asking what essentials do you need / not need for a new baby? Once I read all the responses from my post I was totally overwhelmed. I learned that if I have a question related to a hot button issue of parenting, a text, call or email might be a better form of communication. Thankfully my husband and I have a good circle of parent friends who are able to share parenting successes and failures about our kids without judgement. Viewing other people’s posts on group discussion boards or on your own Facebook feed regarding their children can be daunting and really not give you the outcome you desired. Lesson learned: Trust your instinct regarding your kids. Every time I have done this my gut has not steered me wrong, including the time when I thought my toddler was having explosive diarrhea from teething with his two-year molars which was the case (and is totally a post for another day). Kindness of strangers should never be dismissed. After our youngest son was born (and he gave us a little scare in the NICU) I returned back to my church to become a regular attendee in mass. My lack of attending mass had nothing to do with losing my faith in God or anything, I would like to have categorized myself as a lazy catholic. It seemed like such a chore to attend weekly mass when I could just pray daily at home. After much self-reflection, I decided I needed to go back to the roots that my parents instilled in me and start attending mass on a weekly basis. During our family’s first trip back to mass, I had the good fortune to be greeted after mass by a woman from the parish named Meg who was the group leader for a tiny tot program hosted by the parish on Friday mornings. Meg invited us to participate in the program and our toddler has loved every second of being a part of the class. I call Meg our little angel who in her own sweet way guided our family back to church. I could have just dismissed her kind offer of inviting us to the class, but I’m glad I didn’t. Thank you, Meg, I am forever grateful for your kindness and I hope to pay it forward one day. Lesson learned: reflect upon who you were, where you’ve come from and what you’ve become in order to shape your future self. I tend not to share on social media my personal politic views, as I don’t want to start an argumentative conversation behind a keyboard. But while posting a video of today’s live feed from CNN showing how many people showed up in Chicago for today’s rally and march, I had a FB friend who seemed to think that today’s march was a bunch of “cry babies” and that today’s will “accomplish nothing” and to “get over it”. Being an educator by nature I feel like I need to explain what today’s movement really means to thousands of Americans. Hence why I am hitting the keyboard (extremely aggressively) to have my voice be heard. Note this is NOT to open the door to an argumentative conversation but an op-ed piece to share my point of view. First of all, I want to thank all the #nastywomen and #WomensMarch brigade who hit the pavement this weekend. I loved your signs, your pictures and videos you shared online. Thousands of men, women, children, marched to show the solidarity of one thing – THEY WANT TO BE HEARD. Similar to how many of American had Exercised their first amendment right to assemble for years, so have they. What is bothering me today is the lack of education and pure ignorance on the part of many American who don’t quite understand what The National Women’s March is and what it stands for. So let me share my perspective on what today’s movement means to me. I am writing to frame today’s march as a movement. I would hate to see the days spent by thousands across the country in preparation for today is only seen as a march. I view today’s movement as an awaking to an ideology of a paradigm shift towards understanding the concerns of all Americans, especially the concerns facing all women living in this country. I am a daughter, wife, mother, aunt, educator, and friend who I would like to do my part in helping create a momentum in sharing this movement beyond this weekend. 20 years ago when I graduated high school I viewed the world very differently. My goal in life at 18 was to go to college, get a degree, getting married and have kids. Through expanding my horizons in college and the years beyond, I was given the ability to see the world through a different lens. Through the past 20 years, I have faced injustices in the workplace, unfair pay because of my gender, reproductive challenges, observed friends who have been denied access to affordable health care due to a predetermined medical condition, and the list goes on and on. While everyone faces different adversities in their lifetime, being ignorant to the challenges of those around you is unacceptable, especially if you have been awarded the presidency of the United State and you represent a country which s made up of people who are facing such adversities. As I sit here my kitchen of my home, a well-educated mother of two healthy boys, while my loving and supportive husband is at the grocery store it occurs to me there are no traditional gender roles in our home. Daily we share the duties on who cooks the meals for the day, who takes care of the kids, does the laundry and grocery shopping. We are a united team in our household and I wish this model could be shared across the country in every home and workplace. So what can you do to make your mark on the movement? Volunteer in your community. Share your talents with the less fortunate not just your opinions. Make known your voice not just in words but in actions too. Get informed on local and national politics through credible news sources and practice social responsibility in person and on social media. For more ideas and information on this movement, please visit their website at https://www.womensmarch.com/. While I’ve been a little MIA the past few weeks, it’s all for a good reason. On October 26th, my husband, our son (and new big brother) Jimmy and I welcomed a new little member to our family, Martin “Marty” John Reaney at Prentice Women’s Hospital at Northwestern Medicine. Marty was so excited to meet his new family that he came into this world super fast arriving at 7:07am weighing in a 7 lb, 14 oz and 21 inches long. As many of you are aware, I take daily blood thinners to prevent any blood clots and because of this I was induced for Marty’s arrival. We arrived at Prentice at 1:30AM and, after checking-in and getting settled in the L&D room, my IV and Pitocin was started about 3:30AM. After the contractions became unbearable, I asked the nurse to have the anesthesiologist issue my epidural at about 5:30AM. About an hour into the epidural I started to think that it wasn’t working because I was having some major pains, but unbeknownst to me it was because Marty was trying to arrive on his own. My doctor barely arrived in time to deliver the baby! I labored from start to finish about 3 hours and barely pushed three times before he shot out of me! Because his arrival was so quick he developed a grunting, which sounded like a soft wheezing sound, due to the amniotic fluid still in his lungs. While we thought this sweet sound was cute for about the first hour, when it lasted more than 10 hours post-birth, the pediatric team said it was actually caused from fluid in his lungs which usually would have passed within an hour or two post-birth. 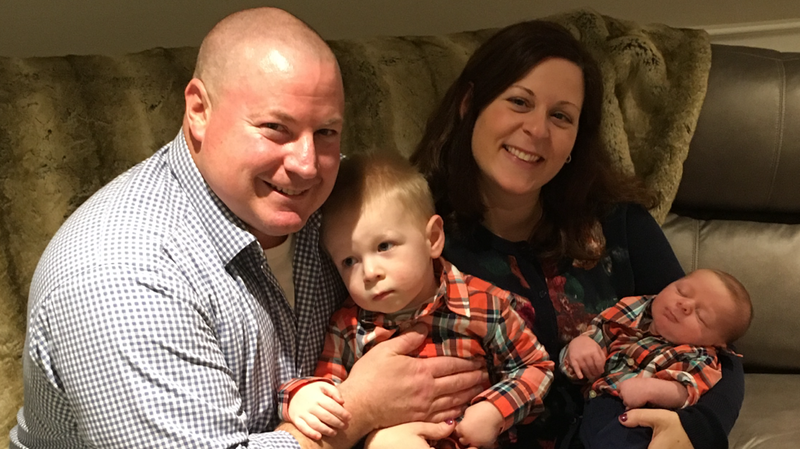 Since Marty was still making this grunting sound, the pediatric team admitted him to the NICU for observation until he was discharged from the hospital 48 hours later. While his oxygen and blood levels were completely normal, the NICU started him on two antibiotics via an IV to prevent any infection he might be fighting off, which was another possible cause of the grunting sound. After his lab work came back all clear, he was finally released from Ann & Robert H. Lurie Children’s Hospital of Chicago. We had a few more bumps in the road medically during Marty’s first weeks (i.e. tongue tie which sent us on an ENT visit to Lurie, an abnormal newborn screen blood test which required four days of isolation at home until the test results came back normal–which they did–and the return of the grunting sound which is the result of his esophagus muscles still developing which is also normal). All of these little bumps in the road had me praying a lot to God and all my angels to make sure our little “Miracle Marty” was safe and healthy, and I have also returned to regular mass attendance (which is a post for another day). While each year I am so blessed and thankful for my family and friends, who are the best support system I could have ever imagined, this year I am truly thankful for the medical caregivers in my life. I am so thankful my OB/GYN, my hematologist and our pediatric offices are all connected on the Northwestern system and talk to each other on a pretty regular basis. I never have to explain my medical history because everyone seems to already know my “case” and is informed on all my medical issues. Over the past month I have received many calls and follow-up calls directly from my doctors checking in on how I’m doing and how Marty is doing. It has been overwhelming, and delightfully comforting, to be known as a patient in a large medical practice, not just a number. Thank you so much to all the caregivers in my life, but especially the unnamed staff and faculty of Northwestern Lurie and Prentice hospitals who continue to give the best care to my little family. You have made this family so very blessed! *This post is part of a monthly series called CEO Mommy which will be guest written by a few amazing ladies in my personal and professional network. This month’s post is by Lorrel Marin who is the founded LEEP Forward, a Pediatric Developmental Clinic for kids with special needs. I met Lorell professionally a few months ago as a scholar in the Goldman Sachs 10,000 Small Business Program in Chicago. As the saying goes, it is important to stop and smell the roses. As a business owner and mom of two little girls it can be difficult to put the brakes on. If you include working on your second master’s degree it can be hard to find time to stop for anything. However, it is important to find the time to acknowledge your accomplishments and see how they can help keep propelling you forward. Without the pause you will stay on automatic pilot and may miss opportunities for true business and personal growth. As a recent graduate from the Goldman Sachs 10,000 Small Business program I wasted no time and moved right into the ICCC program. Both programs have opened doors for me as a business owner in terms of networking and making new connections that open more doors to other opportunities. My business has recently been acknowledged as one of the top 100 fasted growing inner city companies in the country. It was an honor to learn we were #10 on that list acknowledged by ICCC and Fortune Magazine. One of the best lessons I have learned from other thought leaders and successful business people is it is ok to focus on your bank account but it is more important to focus on the impact you have on your community and create a place that allows your employees to continue to grow as well. How to leverage this award and other public recognition is the next step in business development. My company would not be where it is without the support of a wonderfully talented and dedicated team. It seems the best way to leverage the award and recognition the company receives is to make sure the team is inspired by the difference they are making in order to continue to help the company grow. A mission of the company is to ensure as the business grows each employee can benefit and also continue to grow. Leveraging the recent recognition also helps our company stay at the forefront as thought leaders. One way we have been able to do this is to create the National Pediatric Developmental Differences Forum. The NPDDF is a thought leadership initiative for the advancement of relationship -based therapies. It is important to channel this positive recognition into something that will also benefit the community, professionals and families we work with. The NPDDF allows us a platform to provide this. The recent business growth is because of the team. We would not be here without them. They make me a better person, business owner and mom. Lorell received her Masters of Science in Teaching from Pace University, Manhattan, N.Y., her Bachelor of Science degree in Social Work from Richard Stockton State College, N.J. She has also been credentialed as a Developmental Therapist in Illinois. Lorell is currently enrolled in her second master’s program to earn her LCSW in addition to working towards her graduate certificate in Applied Behavior Science. Lorell is the co-founder of the National Developmental Differences Forum (NDPPF). This forum is a thought leadership initiative for the advancement of relationship-based therapies. She founded LEEP Forward, a Pediatric Developmental Clinic for kids with special needs 15 years ago. She recently was acknowledged by Fortune magazine and ICIC as 2016 top 10 company for inner city business development and five year growth.